While trade war rhetoric flies across the globe the US equities market is moving higher. The trade war and what it may do to the global trade arena are a major concern for traders, the caveat is that it’s effect has so far been limited. Yes, there is fear (and for good cause) that the trade war will escalate further and derail the global economy traders aren’t betting on it. Bottom line, it is in the best interest of all involved to settle disputes and get back to business. The business of business is making money and by all accounts US businesses are making money. The second quarter earnings cycle is more than half over and the results are good; earnings growth among S&P 500 companies is topping 22% and expected to edge higher by the end of the cycle. This growth is supported by robust economic health, health that has resulted in a 4.1% read on 2nd quarter GDP. Based on the Index of Leading Indicators and the FOMCs latest read on the economy economic strength is expected to continue for at least the next 6 quarters. The FOMC says labor markets are strong, household spending is strong, fixed investment is strong and all are expected to continue into the end of the year at least. The Index of Leading Indicators advanced 0.5% in June and has been positive for nearly two years. Economists at the Conference Board say the index is pointing to “continued solid growth in the US economy”. Looking to earnings the expectations are robust and that is what is driving equity index valuations. The second quarter cycle is going to end with growth near 25% and that is also expected for the next quarter. Following that we can expect to see growth moderate to about 10% for all of 2018 but remember, that is still double digit earnings growth on top of this years double digit earnings growth. The S&P 500 is moving up and very likely to surpass its all time high in the near term. The index has just confirmed support at the 2,800 level, further supported by the short term EMA, and is indicated higher. 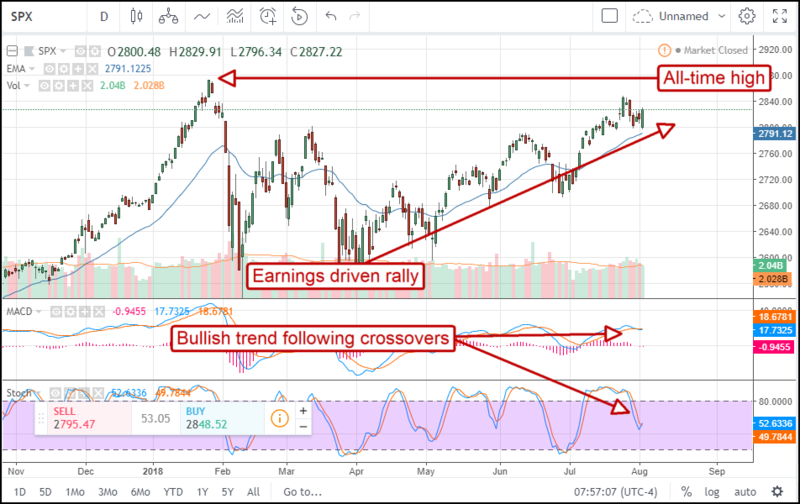 The indicators are still weak but firing the early-trend-following signal, a signal that will take it up to all-time high at least. A break to new all-time highs would be very bullish and likely lead to an extended rally that could last into the end of the year.